The Palm Islands, being the largest man-made island in the world is, without doubt, one of the main attractions in Dubai. 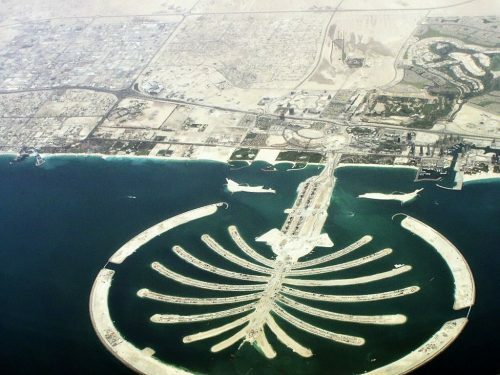 The palm is divided into three islands, namely, Plam Jebel Ali, Palm Deira and Palm Jumeirah. Let’s look into some interesting facts about the islands. Ever wonder how anyone could possibly build an artificial island in the seas? Here’s something you ought to know! Before actually constructing the island, engineers had to do over a hundred studies to plan out what they were going to go about the project! Now, there is no other man-made island on the planet to beat the Palm Islands as it is a cluster of three islands which are liked by each other. This island that was constructed with professional divers too as part of the workforce is even visible from space! Guess the idea was to catch the eye of tourists from space too! Greenery on an artificial island? The Palm Islands are man-made and consists of soil in the form of sand, even the 60 kilometres stretch that joins Dubai and the island is pure shoreline! So how did palm trees get there? For this to happen, 12,000 trees were grown in a nursery. Since this is a famous tourist attention grabber, there would obviously have to be all kinds of hotels on these isles. Be it a luxury hotel like Dukes Dubai or a simple budget hotel, find your accommodation in a Palm Jumeirah hotel in Dubai to fit your wallet. The island is built with over 32 million cubic meters of sand, most of it being from the ocean floor. Also, there is a crescent surrounding the island known as a ‘breakwater’ to protect it from the rough ocean currents that may occur due to typhoons.